While OTT services are having an impact on pay TV providers business models, the bigger impact on the growth of their services comes from within their own companies. As a customer of Verizon’s FiOS service for almost seven years now, I continue to see first hand the impact that Verizon’s poor business practices is having on how they grow their pay TV business, from a subscriber standpoint. Every consumer has their opinion on what’s they are willing to pay for pay TV services and for me, I’ve always said that a triple play bundle of $95.99 a month is something I consider to be reasonable. I get a lot of value out of pay TV, a fast Internet connection and a physical phone, especially since I work from home. But the rate at which all pay TV providers are raising their prices is getting to the point of where they are starting to push even their most loyal customers away. The number one threat to Verizon’s business isn’t product related but rather account related. Verizon is simply charging too much, raising rates too high, too fast, and adding on all kinds of charges. My two-year contract just ended and Verizon raised my triple play price by $25 a month. That’s a 26% price increase. In 2010, my triple play package started off at about $79.99 a month. Then it rose to $95.99, then $109.99 and four years later, it’s now $124.99 a month. And while the Internet speed has double from 25Mbps to 50Mbps in that time, consumers can’t take advantage of it. This is what will stunt the growth of their business, their pricing. Not the speed, quality of the service, how their remote control mobile app works, TV everywhere, etc. – simply their price. Verizon is pushing too hard, too fast, too often with pricing and industry-wide, the push back by consumers is only going to grow. And it’s not because of OTT services, that argument is overrated. For my viewing habits, Netflix offers less than 5% of the content I like to watch. Many OTT services are a fall back for some consumers, but most consumers can’t easily replicate what pay TV providers off, at the same quality, for a cheaper price. But that won’t last forever, and the pay TV providers know it. And what do you think will happen when the pay TV providers add 4K channels? Do you really think they will offer that for free? Of course not. The majority of consumers are not going to buy 4K quality, for an additional cost. No chance. But, we may be forced to as the pay TV providers could simply raise everyone’s bill, even if you don’t want 4K, and then justify that cost increase by saying they offer better quality, even if you don’t want it, can’t take advantage of it or don’t have a 4K TV. Rate increases are expected as programming costs are going up, but at the same time, pay TV providers like Verizon are also increasing their profits. So while they always want to make it sound like it’s not their fault for raising prices and are simply being squeezed by the content owners, they also choose to pass that cost on to customers. Just because they now add a line item to my bill that says “Sports Network Fee,” that doesn’t mean it’s not their fault I’m being charged more each month. I also don’t like how the pay TV providers as a whole purposely make their packages so confusing and in Verizon’s case, always try to trick me. While getting a FiOS quote for a friend last month, I was informed that Verizon has a new policy where they now charge a $70 “activation fee” to “turn on the internet”, even when it is a self install and no Verizon tech has to visit your house. They don’t even have to visit the location, but they still charge $70. That has nothing to do with content licensing costs, it’s just another way they try to squeeze the consumer for more money since no consumer can say no if they want the service. But the sales rep I spoke to when I got the quote didn’t mention the activation fee ever to me. She gave me a quote, was ready to sign me up, and when I asked if there was any install fee, only then did she disclose it. So for the average customer, that would have appeared on their bill after the fact, which is exactly what Verizon wants, because by then it’s too late. Part of Verizon’s reasoning as to why they have to raise rates is that their costs go up, but the company also wastes a ton of money. Last week, I got six Verizon FiOS mailings delivered to my house. 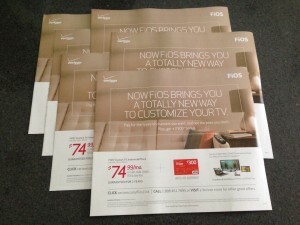 Six mailings in five days, advertising their FiOS service. You would think Verizon would not waste money delivering ads to customers who already have their service, but they don’t do targeted mailings. Instead, they choose to have it delivered to every single mailbox the postman visits, something my postman confirmed. So how much money is Verizon wasting to print and deliver ads, in repetition, to customers who already have the service? I don’t know exactly, but if you figure they spend $3 a year per household for mailings, (which I bet is a low estimate) and they have almost 7M customers getting the mailings, that’s a waste of $21M from their operating budget. Verizon’s FiOS subscriber growth is showing signs of slowing because of price, plain and simple. When someone like me, who has been with FiOS seven years considers switching, they should be worried.